Think through in advance the relevant questions they plan to ask in a conversation or meeting. Get input on the best process/agenda to use in facilitating a conversation or meeting. Receive suggestions of relevant questions to ask during a conversation or meeting. Reflect on a challenging leadership situation they face by answering questions. For each conversation/meeting, you establish the objective and time frame. The app then prompts you with questions. While not a prerequisite, you can either supply your Myers-Briggs Type Indicator® (MBTI) code, or take the LeaderType™ Indicator (LTI), which predicts where you tend to focus in a conversation/meeting, and lets you compare your actual performance in a conversation with the ideal. Who can benefit from LeaderCOACH™? Anyone who leads, influences, facilitates or coaches others— but especially leaders in those collaborative and matrixed organizations where power is more informal and relationships are more egalitarian. How do leaders benefit from LeaderCOACH™? Leaders achieve their goals through others, usually by engaging those individuals in dialogue. However, current tracking by Gallup reveals only 34 percent of employees feel engaged in their jobs. LeaderCOACH™ can help leaders use conversations to better engage their workers, a shift in enthusiasm and empowerment that, in turn, can lead to better results for the organization. What problem does LeaderCOACH™ solve? Leaders face two problems when it comes to having conversations with others in their organization. First, they don’t feel they have the time to have thoughtful conversation, so they tend to deliver (push) information to others rather than ask for (pull) it. Also, most leaders lack the ability to facilitate effective and efficient dialogue. They don’t know where to begin, what to ask, how the conversation should flow, how to conclude – in short, how to fully engage another person in a relatively short time. For these reasons, leaders often lack the will to have meaningful conversations which only leads to employees becoming more resentful and further disengaged. To succeed, leaders need followers’ full and willing commitment; unfortunately, what they typically get is bare-minimum compliance. 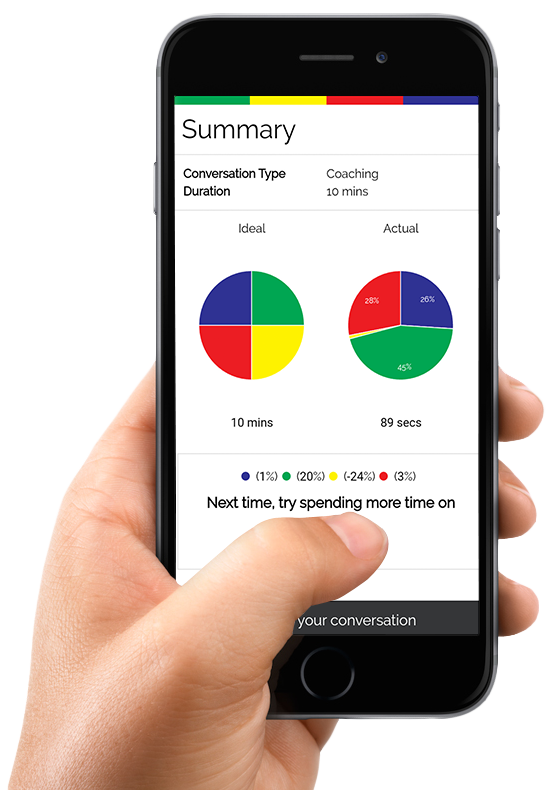 LeaderCOACH™ helps leaders more quickly conduct more effective conversations. It helps them outline how a conversation should flow (i.e. the steps/sequence). It uses neuroscience research to phrase them in a way that gets more insightful, creative responses. And, it nudges them to give greater attention to those elements of the conversation they might neglect or avoid altogether, based on their innate personality biases. Thinking (blue) weighs it against objective criteria (e.g., principles): how clear, how correct, how logical or how reasonable it is; what are its consequences. Jung said, “The four functions are somewhat like the four points on a compass…”: Sensing & Intuition are opposites, as are Feeling & Thinking. All 4 are needed to give a holistic view of a situation or issue. Intuition enables us to divine the hidden possibilities in the background, since these too belong to the complete picture of a given situation. Jung theorized that one of these functions predominates in a personality, and another supports it; the other 2 functions remain largely unconscious. Consequently, we tend to see the world from our unique, yet limited point of view; hence, the need to ask—and answer—questions from all 4 perspectives.